The above info came from Brandon Gordon, and was edited by yours truly (contact me). The image came from A Dragon Ball Z Fansite. Puar is Yamcha's best friend, and former partner in crime. She went to the same shape-shifting school as Oolong the pig, but because she never got kicked out (like Oolong) she can hold a shape apparently as long as she wants. From people (like Goku) to inanimate objects (like a pair of scissors), Puar could probably turn into anything that isn't to huge. She has her moments, but she never really did much in Dragon Ball and especially not Dragon Ball Z . She almost always remained with Yamcha and really does care about him. 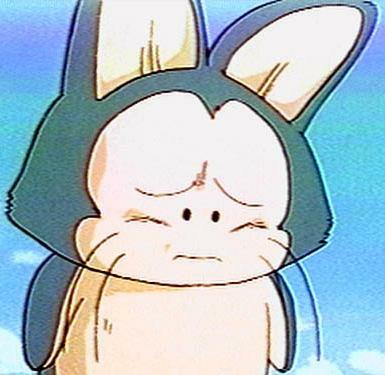 Apparently, Akira Toriyama stated in an interview one time that he always thought of Puar as a male. It is unknown if this means Puar is actually male in the anime, despite having a high-pitched female voice, or if Puar was made a female for whatever reason despite how Akira felt about the character. Or the third option, they don't know themselves so just left it ambiguous. The above description came from Brandon Gordon, and was edited by yours truly (contact me).